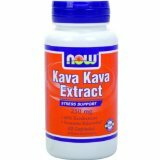 NOW Kava Kava 250mg Details Now Foods Kava Kava Extract Stress Support contains 100% root extract. Now Foods Kava Kava Extract Stress Support yet can help people who can’t sleep, need to relax or are stressed out. As a dietary supplement, take 1 NOW Kava Kava 250mg capsule 1 to 2 times daily as needed. Daily usage not to exceed 4 weeks. Consider taking this product in combination with NOW® Calcium and Magnesium, Relora® and Valerian Root. This entry was posted in Uncategorized and tagged 250mg, Capsules, Kava, Reviews. Bookmark the permalink.